This week in our Staff Picks - Terrorfox1234 shows he has a heart and looks to rehome an elderly gentleman, SirSalami goes all Hitman and sneaks around Skyrim dressed in the clothes of his enemies, Svariato decides that they are going to begin sinking oils back like they are shots to grant various powers to their characters and weapons, and I go all John Woo and decide that I'm going to run through the Fallout 4 wasteland taking pot shots at the limbs of all those who offend or attack me! If you have any comments then please leave them below and if you have any of your own picks then get them to us using the handy form below. We love to hear the communities picks so keep them coming by using this handy form. Please fill out the form completely and ensure that you add some details about the mod and why you have chosen it (similar to how our community members have below). Just remember that other mods on the site may do roughly the same thing, so keep your eyes peeled and understand that these are just personal picks. That said, hopefully, you'll find something you may not have seen before. Poor Linus. When I first played Stardew Valley I did what most people do after getting familiar with the farm and basic mechanics. I headed into town to meet all the townsfolk. Everyone in the town has a generally sunny disposition, which is why I was surprised to find Linus, living in a tent and spending all of his time alone. Through dialogue, you learn that most people aren’t very nice to Linus. He spends his time alone, even at the major festivals and town events, and apparently has had his tent destroyed before. The part that really surprised me though was that, with how giving and accepting the townsfolk are in Stardew Valley, no one was offering help or friendship to this old man in the woods. I thought that eventually, through playing the game, I’d be the one to help Linus out. Turns out the most you can do is make friends with him, but his living situation never improves and you can never do anything for him beyond giving him gifts. This mod finally lets you give Linus the ultimate gift. Four walls and a roof! No more sleeping in a tent and worrying about it getting destroyed! This mod, out of any mod, really fits the spirit of the game, in my opinion. 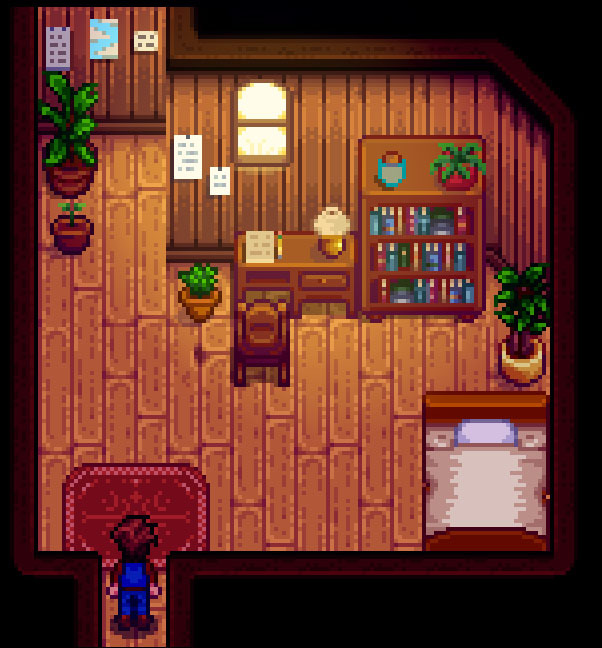 It feels good to help Linus and give him a home in Pelican Town. There is something incredibly satisfying watching a Super Mutant hit the deck after taking out one of his legs with a swift shotgun blast. Not only does it remove some of the air of superiority that these creatures have, but also brings a sense of immersion as weapons now seem to have a much greater impact in a fight. You see it so often in the movies when the protagonist shoots the adversary in the leg, slowing them down; or taking a shot at someone's arm, making them drop the weapon they were just about to let off. Well, this mod is the mod that lets you do all that. Be warned, you may want to stock your companions with stimpaks as the last thing you want is for them to go down and not be able to heal themselves and return to the fight. Don't worry, Dogmeat is okay as he luckily isn't a human, synth or super mutant (obviously!). There are two versions of the mod, so take a read of the description and decide which would best suit your playstyle. Would you like the cripple effect to auto-heal over time or prefer it that you have to ensure that characters have stimpaks to heal themselves. I love the premise of this mod and can't wait to see what the future holds with mods such as this. While lurking in the shadows can be effective, sometimes the best way to be inconspicuous is to hide in plain sight. That's where Master of Disguise comes in. By wearing the appropriate gear, it's now possible to blend in seamlessly with various NPC factions. Enemy soldiers blocking your path? Not a problem. Find some of their armor and mosey on by. Shadowy assassins have you marked for death? Disguise yourself, then subvert and dismantle their organization from the inside out. Group of bandits seem like they're having a good time? Pop on some fur and join them. The choice is yours! Don't let your guard down though as your disguise may not always be effective based on your situation. Enemies of the faction you are masquerading as will likely be aggressive while wearing hostile attire. Additionally, disguises are not fool-proof. You may get spotted if you are too brazen as line-of-sight, distance, lighting, skills, as well as your equipment directly affect the success of your disguise. Fortunately, brief messages will help you to infer how suspicious the surrounding NPCs may be. Kindly, the author has provided very detailed documentation explaining every aspect of the mod, including the impressively enhanced NPC detection system that's included. Even if you're generally not a sneaky character, this mod allows for so many gameplay opportunities that I think most everyone will find some way to enjoy it. Great work. Thanks fireundubh! When it comes to niche mods, I like ones that add something immersive and nifty in a way that I haven't seen before, and Sable17's Smithing Oils is definitely the best example. 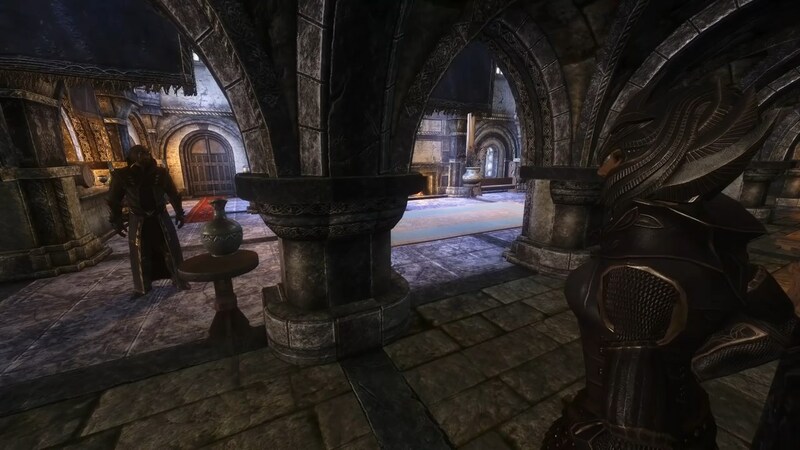 Sable17 describes it as an immersive way for your warrior character to discard the need to delve into enchanting and alchemy to empower your weapons in the world of Skyrim. Why would a zealous and battle-hungry warrior want to sit and mix flowers together or play with fancy magic shards, anyways? That would be totally immersion-shattering. It adds several different oils into the game of several tiers. These oils either consumed by your brave warrior or applied on your undoubtedly deadly weapon to cause various effects in a very balanced way. The oils you ingest may increase your carry weight like a vanilla potion might, or, less like a vanilla potion, heal you over time. There are some that increase your armor rating for a short while as well. The weapon oils add temporary enchantments to your weapons that wear off after a few hits. There's an oil for each element that causes that type of damage as well as magicka/stamina/health drain over time, depending on the type. There are also nifty Animus Oils that you can apply to your weapon. 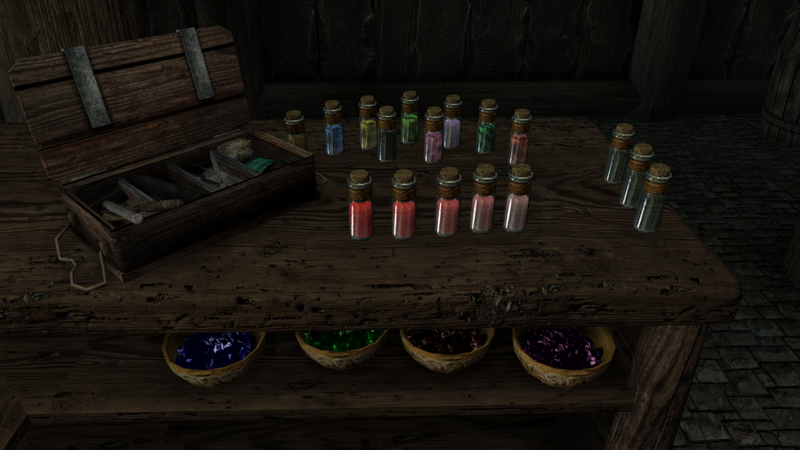 These oils increase your damage against a specific race or beast in Skyrim. I've only touched on a few of the oils included. There are several more with even cooler effects, not to mention a great and immersive crafting system that scales with Smithing rather than Alchemy or Enchanting. I'll leave you to discover the rest. Personally, even if I don't play a warrior character, I include it anyways because it's simply an awesome mod. Thanks, Sable17, for such a cool mod! Every week, we feature a few mods that have caught our staff's attention, as well as some that were submitted by you, the Nexus Mods community. If there is a mod you'd like to see on this list, then please check out this quick and handy form. If you haven't already, feel free to follow us on our social media channels where we'll keep you up to date with the latest site news, articles and much more. Thanks, and have fun modding! I don't know what's going on but I can't access anything other than files download. Forums, chat nothing. Heck, I can't even create a new account or go premium. Whats wrong? I know this isn't the place to talk about this but appears to be the only one I can access. not place to do this but i cant find. im premium and only downloading at 27kb a sec, sofia mod has been download an hour? any issues going on ? The North America premium server hasn't worked in months (Setting my preferred server to North America premium still downloads from the CDN) & I've also noticed a slow-down in download speeds as well despite my being a lifetime premium member. While my speeds aren't 27 KB/sec (mine used to run at a 7-8 Mb/sec clip but now run between 2-3 Mb/sec), they're still noticeably slower than they used to be. I posted a bug report regarding this issue several months ago but never got a reply back from anyone in the Forums, be it a Nexus staff member or other user here on the Nexus sites. What happens with BlindJudge and Staff picks? Nice picks! Would minecraft maps be eligible for these? Even though they aren't mods..? It's been well over a month since this last staff picks. Have you guys decided against doing it anymore, or what? I enjoy finding new mods (and sometimes even new games) and the brief opinions you guys give on them through this medium. Hope to see more in the future. isn't http://www.nexusmods.com/fallout4/mods/16400/? Live Dismemberment do same as Realistic Crippled Limbs Effects only with mutilation? There are a few differences. Live Dismemberment works on a variety of NPCs, not just humanoids. 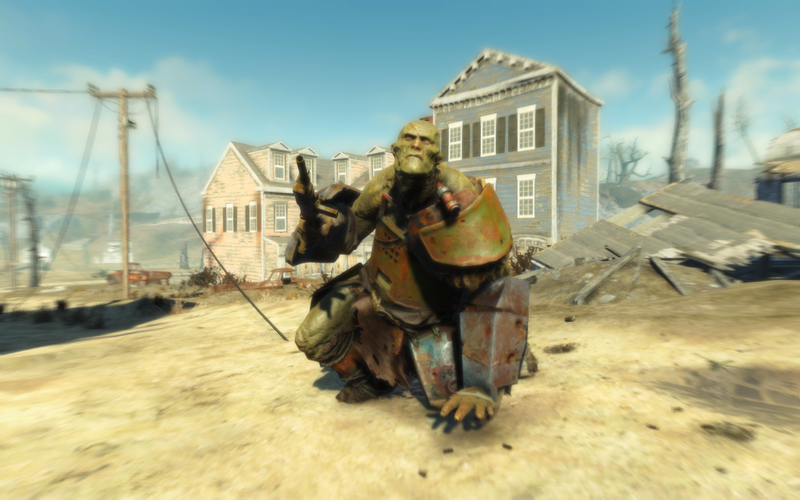 For example, you can plop the legs out from under a deathclaw or other melee NPC in Live Dismemberment, but Realistic Crippled Limbs only touches Humans, Synths, and Super Mutants. Additionally, Realistic Crippled Limbs make changes in different categories, so the effects ALSO affect you, the player. If your legs are crippled, you're not just slow, you're unable to move. Live Dismemberment accomplishes what it does by making different edits, and the player character remains immune as a result of this difference. They're very similar, but their respective approaches and scope are not the same. The crippled limbs mod sounds pretty cool. I think it was Fallout 3 where I tested out a mod that added raider children. It really gave you a sense of sadness and you felt a bit bad for them. I imagine that if this mod works as I believe it to you may find yourself feeling pity on a crippled enemy in a way that you never thought you would. That would add A LOT of additional "experience" to the game. Pretty cool. Raider Children for F4 and probably Lil Bastards for 3. Thank you Ethreon, will take a look into them. I actually read a comment that someone said it made them feel bad... so it may have influenced me in feeling bad lol.... but now I can't help it.